Even though the Rutgers Debate Union wasn’t able to attend NorthAms in Ontario last week due to inclement weather, the successes of last weekend’s tournament at University at Albany, SUNY on January 29 and 30 certainly compensated for whatever feelings of regret or disappointment that our members were perhaps harboring. For the first time in Rutgers history, our debaters closed out the tournament: Top Varsity Team went to Pasha Temkin ’18 and Max Albert ’19, who are two novices and our current President and Vice President respectively. Second place went to Sean Leonard ’16 and Nick Hansen ’16, the former holders of the aforementioned offices. Our worthy competitors were from Swarthmore (beat four times! ), Dartmouth, Brandeis, Yale (beat twice! ), and many other universities. The Temkin-Albert feat is especially exceptional when considering that they, being a novice team, triumphed over actual varsity teams by attaining the title of Top Varsity Team, and are now tied for Fourth Top Team in the country! This is the first time in APDA (American Parliamentary Debate Association) history that a novice team has ever made the top ten for varsity. Rutgers has also risen to 6th College of the Year (still being the only public school in the top ten), following a lead ahead of Stanford, American, Princeton, and Johns Hopkins. More information on current rankings can be seen here. Also debating at the tournament were Treasurer Larry Feltz ’17 and Jeremy “Jimmy” Kritz ’19, and PR Chair Andrea Vacchiano ’19 with David Vlnarov ’19. Judging with us was our new novice, David Blanco ’18. RUDU was also delightfully reunited with our former President, Quinn Maingi ’15, at the tournament. This past weekend was an excellent way to wrap things up before we host our own tournament on February 5 and 6. We are looking forward to hosting an APDA meeting and will be expecting over 100 teams! RUDU Goes to CMU: Leonard continues his winning streak, Temkin and Albert climb from novice to varsity! Classes start again this Tuesday at Rutgers, and members of the debate union spent their last weekend of winter break competing at Carnegie Mellon University in Pittsburgh, PA. Debating at the tournament were Sean Leonard ’16, Naeem Hossain ’18, Pasha Temkin ’18, Elise Zhou ’18 and Max Albert ’19. Larry Feltz ’17 also came along to judge rounds. Our President and Vice President, Temkin ’18 and Albert ’19, performed remarkably as a novice team, having an impeccable record of 5 – 0 before breaking and making it to quarter finals. Temkin ’18 was awarded 3rd Novice Speaker and Albert ’19 was named 4th Novice Speaker. They both performed so well that they moved up to the varsity level and were named 7th Varsity Speaker and 10th Varsity Speaker, respectively! Just like last week, Leonard ’16 outperformed at the tournament and placed as Top Varsity Speaker! He also paired up with Geneva Kropper from University of Maryland and together they conquered the final rounds and placed as Top Varsity Team of the tournament! Finally, Hossain ’18 and Zhou ’18 also had an admirable record of 3 – 2! RUDU had a great tournament, congratulations to all of the debaters at Rutgers and the other schools! Next weekend, a few of our members are crossing the US/Canadian border to debate at the North American Championships Tournament at Queens College in Kingston, Ontario. This is a very prestigious gathering of debaters and there is no doubt that RUDU deserves to be there. In addition, RUDU will have a spot at the Spring Involvement Fair this Monday at the College Avenue Gym from 1pm to 4pm. Feel free to join us! 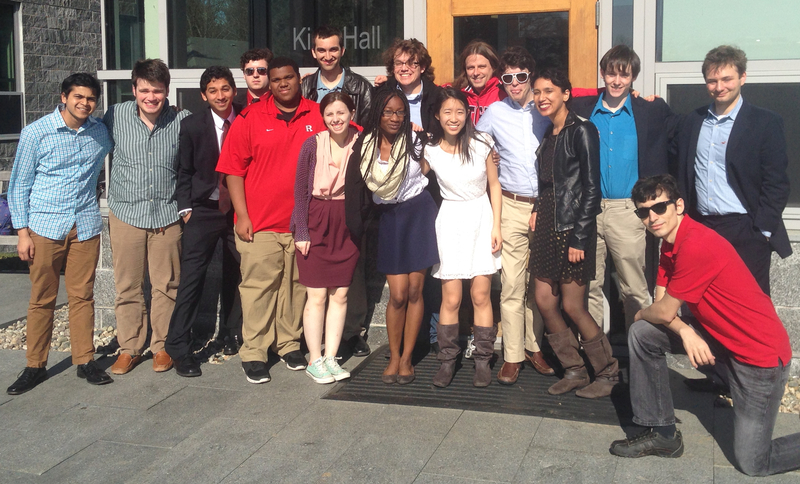 Rutgers in Finals at Vassar, Kunnan Top Novice! The Rutgers University Debate Union had an excellent tournament at Vassar College in Poughkeepsie, New York this weekend! Five teams competed, three finished with winning records, and five Rutgers alumni came out to judge! Henry Phipps, a 2015 Rutgers graduate, even flew in from his home in Portland, Oregon to surprise his RUDU family. Two teams–Kurt Falk ’16 and Russell Potter ’15, and Quinn Maingi ’15 and Sean Leonard ’16– reached varsity outrounds at the competitive tournament. 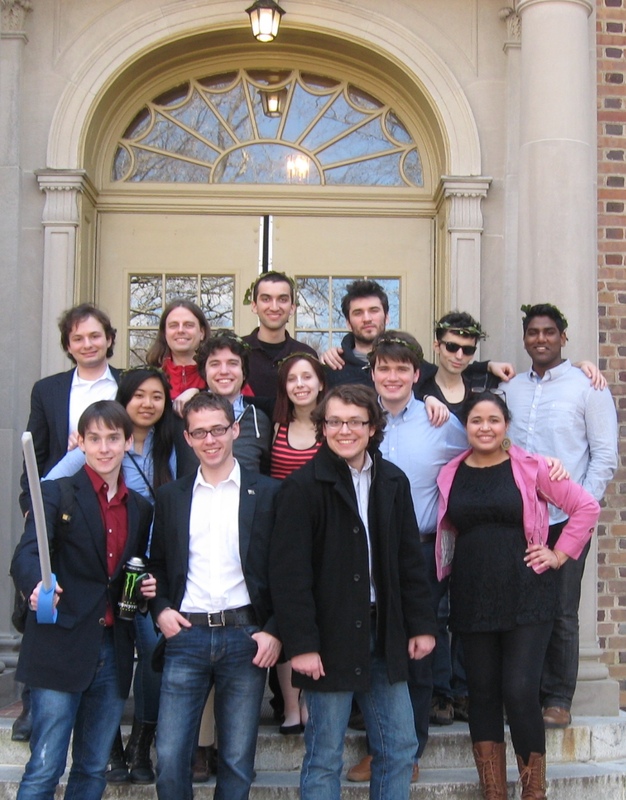 Both teams won their quarterfinal rounds, and the two Rutgers teams faced off in semifinals. Both teams were so skillful, many audience members recalled the experience as “paranormal.” In the end, Falk and Potter advanced to finals on a 2-1 decision. Leonard and Maingi now stand at 7th Team of the Year, while Falk and Potter made their first entry on the board at 12th. Leonard also finished the tournament as the 6th speaker. 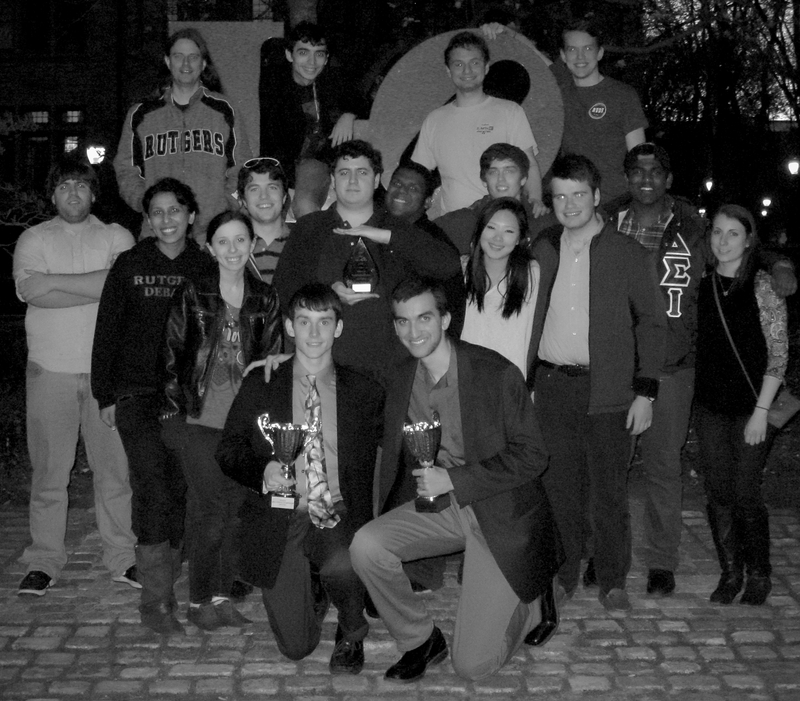 In addition to the varsity wins, Rutgers continued its tradition of excellence in novice awards! Minal Kunnan ’15 finished the tournament as the best novice speaker. We know he’ll do Rutgers proud in the coming months. Next weekend, RUDU will be competing at Harvard University in Cambridge, Massachusetts. 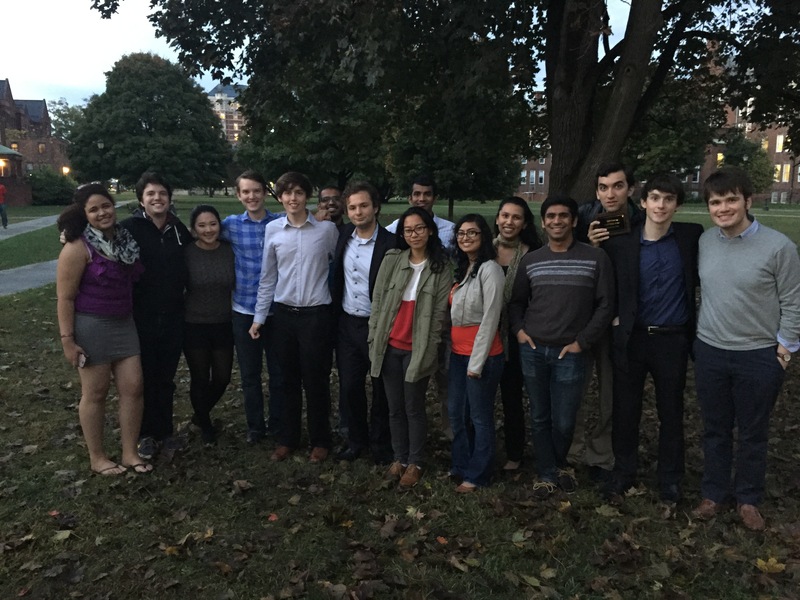 The Rutgers University Debate Union started off the American Parliamentary Debate Association season with four debate teams competing at the John Hopkins University tournament. The four teams consisted of varsity members Quinn Maingi & Sean Leonard, Nick Hansen & Rachel Moon, Kurt Falk & Russell Potter, and George Alukal teaming with novice Minnal Kunnan. Each team competed in 5 preliminary debate rounds, with 3 of the teams finishing with a winning record. Quinn Maingi & Sean Leonard (last year’s runners up at the APDA National Championship) finished the tournament as the top seed with a 5–0 record and made it to the quarterfinals of the tournament. Maingi & Leonard finished as the 5th best varsity team at the tournament. In addition to having a team competing in the quarterfinals of the tournament, members of the team won individual speaking awards. Quinn won 8th place varsity speaker and newcomer Minnal won 3rd place novice speaker. The team of Maingi & Leonard is now tied for 4th Team of The Year (TOTY), and RUDU is tied for 4th College of the Year (COTY). The RUDU team represented their new academic home, the School of Communication & Information, with well-thought out arguments and positive energy. Each member of the team showed the power of their communication and has started the debate season with a bang! Congratulations to each team that competed at John Hopkins this weekend! The Rutgers University Debate Union (RUDU) earned its greatest accomplishment in team history yesterday with a run to the National Championship Final Round by Quinn Maingi & Sean Leonard. The junior/sophomore duo are just the fourth partnership in the 2000s without a senior on the team to make it to the National Final. They also became the first team since University of Virginia in 2003 to make the National Finals from a public institution. After two grueling days of competition on Friday and Saturday, in which Maingi & Leonard defeated many of the best teams in the nation, it was announced at the Saturday night Banquet that they had become just the third team in RUDU history to reach the elimination rounds at Nationals. Ashley Novak & Chris Bergman made octofinals last year and David Reiss & Kyle Bomeisl did the same in 2011. Maingi & Leonard faced Bates in octofinals and won a 2-1 decision, marking the first time ever that Rutgers won a National elimination round. They went on to rematch against a Johns Hopkins team they had beaten in preliminary rounds and carried the quarterfinal by a 4-1 margin. In semifinals, they faced a Harvard team that had made elims as the top seed, winning all six preliminary rounds including a win over them in prelims. But Rutgers smashed their eight-round winning run at Nationals with a 4-1 win that put Maingi & Leonard in the National Finals. Despite losing the Final to Yale on a unanimous decision, Rutgers’ intense debate duo has electrified a debate league normally dominated by Ivy League elites. 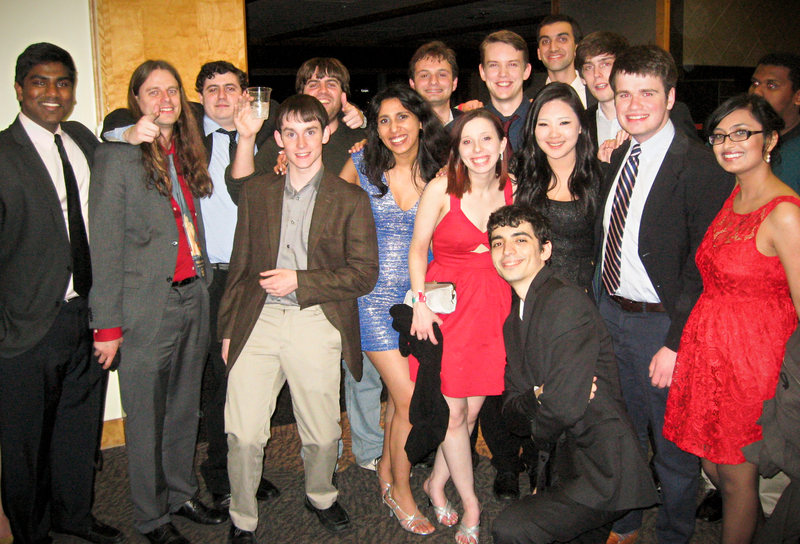 Harvard had won the previous two National Championships and the Ivy League has collectively won 14 of the last 17 American Parliamentary Debate Association (APDA) titles. The other three were won by Boston University, Johns Hopkins University, and Stanford University. The lone public institution to ever win a National Championship on APDA was the US Naval Academy in 1984. RUDU finished the 2013-2014 season ranked fifth on APDA in the College of the Year (COTY) rankings. It was Rutgers’ fourth straight year in the top ten and tied for their second-highest finish. The team record was set last year at third. And while the team set a school record with eight qualifications for Nationals, no one among the five teams preparing to attend the Championship saw the run to Finals coming. Indeed, Rutgers entered the octofinals with the #13 seed of the sixteen teams who made the cut, making the Championship Final appearance all the sweeter. The partnerships that Maingi & Leonard defeated in elimination rounds were ranked 4th, 6th, and 5th respectively in APDA’s Team of the Year (TOTY) rankings. The semifinal team from Harvard ranked 5th in TOTY included one of the debaters who was on the #1 ranked TOTY team. The final round opponents from Yale and eventual Champions were the #2 ranked TOTY pairing. One of those debaters was also on the #3 ranked team, meaning that RUDU’s team faced a debater on every one of the top six ranked teams at the Championships en route to taking 2nd overall. RUDU has risen to prominence in the last five years after struggling in obscurity during its first decade on the APDA circuit. After being founded in 2001, the team never cracked the top ten in the national rankings until finishing 5th in 2010-2011. The last four years have featured countless successes and qualifications for Nationals, all culminating in this tremendous and almost unprecedented success for a state university. Rutgers sent four other teams to the Championships, including Vidhaath Sripathi, whose top ten novice speaker finish reflects Leonard’s fifth novice speaker award from the 2013 Championships. If Leonard’s meteoric rise this year is any indication, Sripathi has the brightest of futures ahead for the team. RUDU spent the four days leading up to the Championships all but sequestered at the “Debate House” at 11 Bartlett Street writing and rewriting cases, running practice rounds and drills, and preparing for the other teams who would be contending at the Championships. The work of the five teams and Coach Storey Clayton was supplemented by an inspiring surprise visit from David Reiss, who was on the first Rutgers team to make elimination rounds and the TOTY rankings. Reiss now lives in Austin, Texas and was flying home for Passover, but chose not to tell RUDU he would be showing up to help out. Maingi and Leonard will be among the many returning debaters to next year’s RUDU squad who will hope to rise in the COTY rankings and again contend for a National Championship. Sripathi, Russell Potter, Arbi Llaveshi, Rachel Moon, and Nick Hansen are all returning debaters who attended this year’s Championship. RUDU celebrates after the National Championship Final Round in front of the iconic LOVE statue at the University of Pennsylvania. Kneeling in front with Second Place trophies: Sean Leonard and Quinn Maingi. 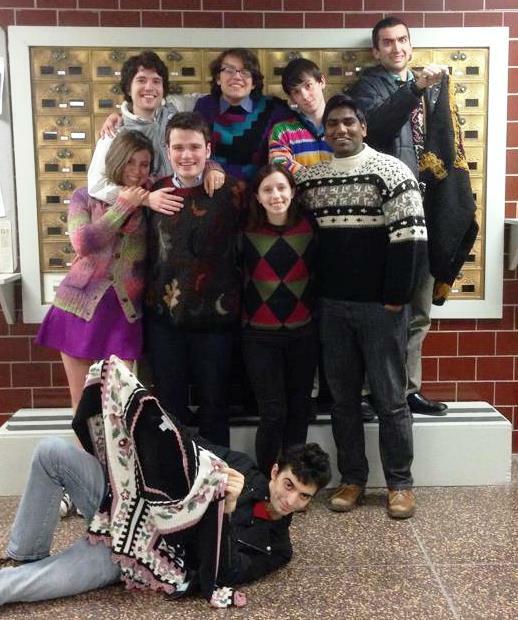 Middle row, standing: Kyle Bomeisl, Deepta Janardhan, Alex Jubb, Henry Phipps, Adam Bomeisl (with 5th Place COTY trophy), Maxwell Williams, Rachel Moon, Kurt Falk, Nick Hansen, Vidhaath Sripathi, and Ashley Novak. Top row: Storey Clayton, Arbi Llaveshi, Russell Potter, and Jason Boyle. RUDU gathers in the bright sun of the Amherst campus to celebrate the last regular season tournament of the year. Left to right: Grisam Shah, Nick Hansen, Ali Ismail, Adam Bomeisl, Maxwell Williams, Quinn Maingi, Alex Jubb, Yaqarah Letellier, Zach Sinkiewicz, Lin Lan, Storey Clayton, Henry Phipps, Deepta Janardhan, Sean Leonard, Arbi Llaveshi, and Russell Potter. The Rutgers University Debate Union (RUDU) closed out one of the most successful years in its history with a strong finish at the Amherst tournament. Russell Potter & Alex Jubb made semifinals, Sean Leonard & Henry Phipps made quarterfinals, and Phipps qualified for Nationals in the last weekend of the regular season, breaking last year’s team record for qualifications. Last year, RUDU set a team record with seven qualifications for Nationals, sending five full teams. This year, Rutgers eclipsed that mark with eight quals, behind only Yale (11) and Harvard (9). Rutgers also finished the year ranked 5th, less than 4 points behind rival Johns Hopkins for 4th. Rutgers has finished one rank ahead of Hopkins in the final national standings in two of the previous three seasons. The Rutgers debaters qualified for Nationals are Potter, Leonard, Phipps, Maingi, Ashley Novak, Arbi Llaveshi, Rachel Moon, and Nick Hansen. All but Novak will be attending the National Championships as she elected to end her debating career at the Princeton tournament in March. The seven qualified debaters will be joined by three teammates to comprise the five Rutgers teams representing the university at Nationals. The National Championships this year will be held at the University of Pennsylvania in Philadelphia from April 18-20, 2014. RUDU is now beginning its last week of extensive preparation for the Championships, where Novak and Chris Bergman finished 9th overall last year. Novak finished 7th Speaker of the Year (SOTY), the first time a Rutgers debater has ever finished in the top ten of those standings at year’s end. Everyone finishing ahead of her is an Ivy League student with the exception of one from Brandeis who finished tied for 5th. She was also the second-ranked female speaker in the league, behind Brown’s Jean McCabe, who finished 3rd in the overall SOTY standings. They were joined by Swarthmore’s Jodie Goodman and Brandeis’ Shira Almeleh in marking the most women in the top ten of SOTY since the 2001-2002 season, when half the top ten were female. The national top five teams on the American Parliamentary Debate Association (APDA) circuit were unchanged from last year, though the rankings reshuffled a bit. This year, Rutgers was fifth behind Yale, Harvard, Brandeis, and Johns Hopkins. Last season, Yale was also top, Brandeis second, Rutgers third, Johns Hopkins fourth, and Harvard fifth. Despite finishing 5th this season, Rutgers actually set a team record for rankings points in the College of the Year (COTY) standings, with 257.5 edging last year’s mark of 257. Rutgers is one of just three public institutions in this year’s top 25, ahead of #11 William & Mary and #15 Maryland. Rutgers finished ahead of New Jersey rival Princeton for the fourth straight year. The Rutgers University Debate Union (RUDU) broke three teams to quarterfinals at the Binghamton University tournament this weekend, qualifying Nick Hansen and Arbi Llaveshi for Nationals and earning a spot in varsity finals for the second straight week. It was the ninth straight varsity break weekend for the team who is in a close race with Brown and Johns Hopkins for 4th overall in the national rankings with one week left in the regular season. The trip to finals was the second this season for Llaveshi, who also finaled at UMBC with Deepta Janardhan. It was the first for Maingi since he won the Albany tournament with Jubb last year. Both Hansen, a novice, and Llaveshi, qualified for the first time in their careers, though Llaveshi represented Rutgers as the free seed at the 2012 National Championships. Maingi & Llaveshi beat a Yale team in quarterfinals and a Princeton team in semifinals before dropping a 2-1 decision to a Stanford/Princeton hybrid team in the final round. With the qualifications, RUDU has now tied a team record with seven Nats quals, the record set last year. Phipps fell just short of qualifying after a 2-1 loss to Princeton in the quarterfinals and now stands at 13.25 of the necessary 14 points with one weekend left before the National Championships at the University of Pennsylvania in Philadelphia. Previously qualified debaters this season include Maingi, Leonard, Ashley Novak, Russell Potter, and Rachel Moon. Meanwhile, three RUDU teams spent the same weekend on the campus of Swarthmore College for a tournament co-hosted by NYU and Rutgers and officially known as the “NYU” tournament. There, Potter and Janardhan made the quarterfinals in a small but extremely competitive field before dropping to the eventual finalists from American University. RUDU will be sending several teams to the Georgetown tournament this weekend, the last chance to earn qualifications for those who are close, including Phipps, Janardhan, Jubb, and Adam Bomeisl. Any one of them qualifying would set the team record for qualifications. If two or more qualify, Rutgers will earn the right to send six full teams to Nationals. Currently, if nothing changes, RUDU is slated to send five full teams. The lineup of RUDU debaters and judges for the “NYU” tournament on the Swarthmore campus. 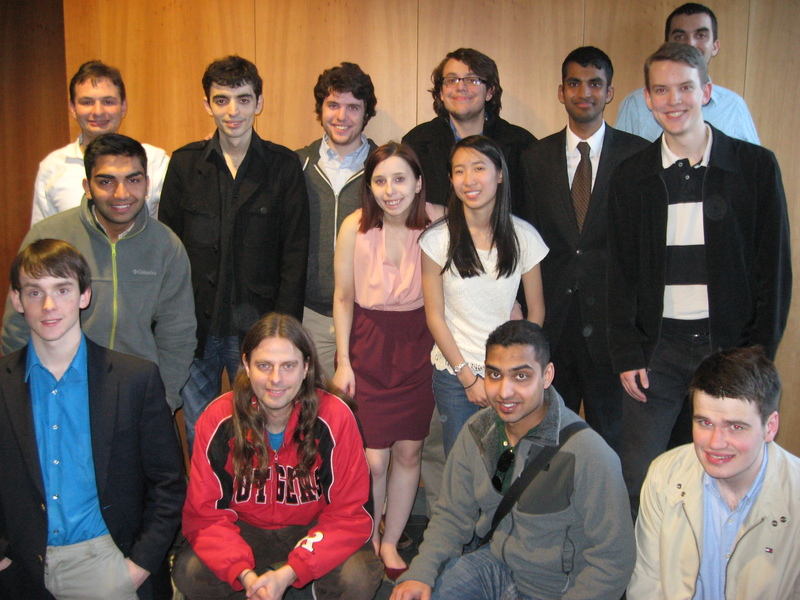 Left to right: Kurt Falk, Deepta Janardhan, Jason Boyle, Russell Potter, Nimit Jindal, Storey Clayton, Grisam Shah, Brianna Florovito, and Victoria Disla. 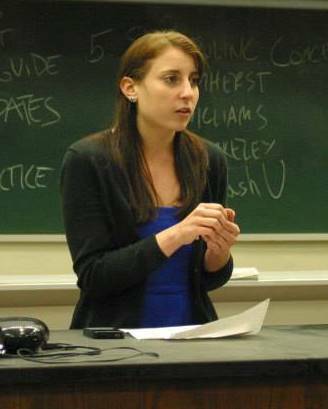 A file photo of Ashley Novak, whose success this weekend at Princeton brought her to 7th in the Speaker of the Year (SOTY) rankings. The Rutgers University Debate Union (RUDU) made it eight straight weeks in the break with a huge run by Ashley Novak at Princeton this weekend. The team’s top speaker and former President made it all the way to finals after winning eight rounds in a row with her partner from Brandeis. She also finished as the 3rd place individual speaker and shot back up to 7th overall in the Speaker of the Year (SOTY) standings, the ranking of individual debaters on the APDA league. Several other teams from RUDU compiled winning records, including Sean Leonard and Arbi Llaveshi, who just missed making the elimination rounds after a loss in their 3-1 round against a team from Yale. The performance by Novak this weekend all but secures her spot in the top ten of SOTY, the first time any RUDU debater will have achieved that feat. Two weeks remain in the regular season this year and Rutgers is 6th in the country. With five debaters qualified for Nationals and several more on the verge, there is much hope for RUDU heading into the National Championships at the University of Pennsylvania at the end of this month. The Rutgers University Debate Union (RUDU) made the elimination rounds for the seventh straight weekend on the American Parliamentary Debate Association (APDA) circuit, finishing 6th and 10th teams and inching closer to additional qualifications to the National Championships. Hansen now stands just half a point away from qualifying for Nationals, having come up just short in a 2-1 decision in quarterfinals with Leonard. Leonard’s 3rd speaker finish marked his fourth time in five tournaments where he has finished in the top seven speakers and the third time of those where he has been in the top three. With this surge, he now stands ranked 13th in APDA’s annual Speaker of the Year (SOTY) rankings for the season, and is second among sophomore debaters in the league. Hansen, meanwhile, won a novice speaker award for the fourth straight tournament, all of them top five placings. He has risen back to twelfth overall in the Novice of the Year (NOTY) rankings with three weekends remaining in the season. Novak remains 9th ranked SOTY and has her sights on being the first Rutgers debater to finish the year in the top ten. The current record is held by Dave Reiss, who finished 14th in 2010-2011. RUDU will be joining the rest of APDA at the Princeton University tournament this weekend, just down Route 1 from Rutgers. RUDU will be sending several teams in the hopes of adding to the five currently qualified debaters to attend Nationals, as well as improving on the sixth place standing the school has this year. Elections for the league’s Board will also be held. Just before Princeton, RUDU will be conducting its biggest public debate of the semester, on whether Condoleezza Rice should be the 2014 Commencement Speaker at Rutgers. Well over 100 people are already slated to attend the debate, which will be held before the meeting of the Rutgers University Student Assembly (RUSA), to be followed by a RUSA vote on the resolution as debated. Arbi Llaveshi, Rachel Moon, and Sean Leonard will be speaking for the resolution and Daimler Vadlamuri, Russell Potter, and Deepta Janardhan will be speaking against. The speakers will not necessarily be representing their own views on the topic, as is typical in debate. The Rutgers University Debate Union (RUDU) broke a record four teams to quarterfinals at William & Mary this weekend, taking the 5th through 8th spots and also appearing in novice finals. While RUDU had broken four teams at the University of Pennsylvania this season as well, two of them dropped in octofinals and thus this was the first time Rutgers comprised half the quarterfinal bracket. The top speaker award for Leonard is the third this year and the fourth of his career, both extending team records he set earlier this season. He is now the 15th ranked speaker in the country, joining teammates Ashley Novak and Maingi in the top twenty. The break to novice finals was the first ever for Disla and the third novice break in a row for Sinkiewicz. The tournaments this weekend ran Rutgers’ break streak to six weekends and pushed several debaters even closer to qualifying for Nationals with a month to go before the prestigious championships. Llaveshi now leads the pack with 13 points of the necessary 14, with Phipps (12.75) and Hansen (11.5) close behind. Deepta Janardhan (11), Adam Bomeisl (8.75), and Jubb (7.5) are also all over halfway. Sripathi broke for the second time in a month and stands at 2 points and Morrisette earned qualification points for the first time this season. Five RUDU debaters (Novak, Russell Potter, Leonard, Rachel Moon, and Maingi) are already qualified to attend Nationals. The team as a whole is chasing last year’s team record of seven qualifications for a season. While Rutgers is on spring break this week, the season schedule rolls on with seven teams slated to compete for Rutgers at Swarthmore this weekend. © 2019 Rutgers University Debate Union. Designed and maintained by Pasha Temkin.